September 10 marked a year since Anita Roddick left us in hurry, with so much unfinished business. At the end of our last encounter in the summer of 2003, she autographed for me a copy of her latest book with these words: “Remember me!”. She remains one of the most remarkable people I have met. Especially in the past year, which has been eventful and tumultuous for me, I have often thought of Anita’s long and colourful journey from working class mom to one of the most successful entrepreneurs of our time….and onward to become an outspoken and passionate activist for social justice, human rights and the environment. As she has written, it was not an easy ride to do well in the male-dominated world of business, nor was it any easier to do good in the greed-dominated world at large. But she not only did it, but had great fun doing so. What would Anita do? I find myself asking this question every now and then when I seem to be struggling against enormous odds (which is increasingly often). I don’t always find the answers I’m looking for, but it’s always a useful reflection. Well, we can honestly say that she’s one person who practised what she preached. ‘I am an Activist’ is also the sub-title of a DVD that celebrates the life of Dame Anita Roddick, which is available for sale and/or download from Anita Roddick.com. It compiles footage gathered on 23 October 2007, when thousands of thinkers, artists, activists, and other heroic saboteurs of the status quo gathered to celebrate the remarkable life and legacy of Anita Roddick. According to the blurb, it features key people from groups like Amnesty International, Greenpeace, Reprieve, The Body Shop, as well as family and close friends, as they laugh and cry and ultimately take to the streets to launch. In the weeks and months since Anita’s death, more video material featuring her public talks and interviews have been shared on YouTube by individuals and organisations. I have this week watched several of them, and felt there still isn’t sufficiently good moving images about her. In her time she must have done hundreds or thousands of interviews for broadcast television, corporate audiences as well as community groups. At least some of these must have been recorded and archived. But we still don’t see enough out there, at least in easily accessible public video platforms like YouTube. From University of California Television comes this video of Anita delivering the Nuclear Peace Age’s third annual Frank K. Kelly Lecture on Humanity’s Future in Feb 2004. Citizen journalist, film-maker and media critic Rory O’Connor has written a moving tribute to extraordinary activist and entrepreneur Anita Roddick, whose premature death on 12 September 2007 has left her many admirers in shock and grief. He recalls how colleague and fellow media-activist Danny Schechter and he first met Anita at a gathering of progressive business executives called the Social Ventures Network. Their shared background, vision and ideals soon turned them into friends and co-conspirators. Read the full tribute on Media is a Plural website. Read my own tribute to Anita Roddick: We shall always remember you! Dame Anita Roddick would have been proud of her mastery of Khmer. There she was on a large screen, speaking in fluent Khmer, watched by over a thousand Cambodians women, children and men. There we were, practically in the shadow of the massive Angkor Wat temple complex, and trying to reach out to rural Cambodians on practical ways to live more sustainable lives. The event was an evening of variety entertainment laced with some information and education. Colleagues at Action IEC, our Cambodian partner, knew exactly how to get this mix right. 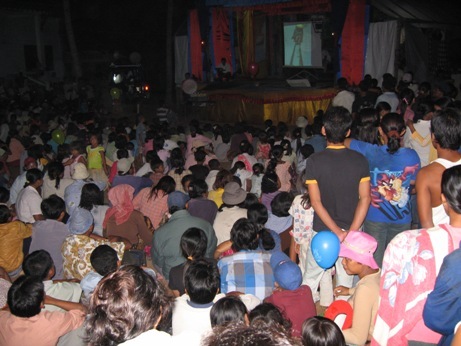 Amidst songs, drama, comedy and live competitions, they screened Hands On video films versioned into Khmer. 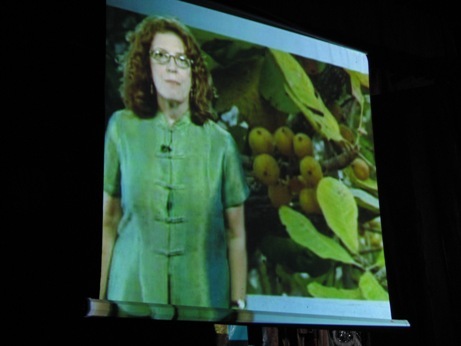 As the loudspeakers boomed and (Hands On host) Anita Roddick appeared on screen speaking in a strange tongue, I watched the audience closely. They were spell-bound: especially the children belied a sense of wonder. But sustaining their attention is a big challenge. That evening’s 4-hr programme was the result of over a dozen Cambodian colleagues planning and working for days. 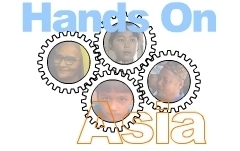 It was part of the public outreach activity for Hands On films that we versioned into Khmer under a 4-country, Asian project called Localising Hands On in Asia. The young and not-so-young in our audience that evening were there mainly for the fun and games. Rolling out Anita and Hands On was a clever ploy by Kosal, Cedric and other Cambodian colleagues. Call it ‘sugar-coating’ the development pill. Oh yes, we also had the Khmer versioned programmes broadcast on Cambodia’s most popular TV channel (CTN). That engaged a different kind of audience. A passive broadcast can never really produce the kind of audience engagement we saw that evening. In our efforts to engage Asia’s eyeballs and minds, we’ve made modest progress by proceeding parallely on broadcast and narrowcast fronts — but there is a great deal of unfinished business.